“We saw a generation that is hugely keen to participate and have more time than millennials, so we sought out Seven because they were the best player in the older demographic market." Research from 2013 found that 94% of baby boomers disliked the way advertisers communicated with them, and only 10% of advertising spend by Australian companies was targeted at over 55s. Wilson says the demographic has previously been barraged with funeral and insurance ads and advertisers weren’t keen to invest. While Starts at 60 already has advertising partnerships in place with Australian Super, AAT Kings, Dymocks, Connect Hearing and Hachette, Seven West Media plans to build on Starts at 60 advertising and sell it across multiple platforms. “We are growing at such a speed we needed to take the opportunity to get it right with the technology and ad tech services that Seven Network could provide. What Seven brings is an ability to reach the right advertisers at the right market and have the right connection,” says Wilson. Seven West Media CEO Tim Worner says Starts at 60 will sit within Pacific Magazines alongside other brands that appeal to this demographic, including BHG and Prevention. “People aged 60-and-over constitute Australia's fastest growing age group with huge spending power and influence," Worner says. Controlling more than half of all consumer spending in the western world, baby boomers are one of the fastest growing demographics in Australia. In Australia alone more than 5.2million boomers enjoy a new era of financial and personal freedom, making up more than 20% of our population. Perhap's it's then no surprise that Seven West Media has firmly placed its intent with this demographic, announcing last week it was entering into the lucrative baby boomers market. A recent Nielsen report found that baby boomers buy 77% of all prescription drugs, 61% of over-the-counter drugs and 80% of all leisure travel. Yet they have remained untapped by advertisers, despite the thriving potential market. It’s a potential that 'Starts at 60', a new information website and online community for seniors and over 60s in Australia and New Zealand, has harnessed and that Seven West Media is keen to take a slice off, a 33% slice to be exact. 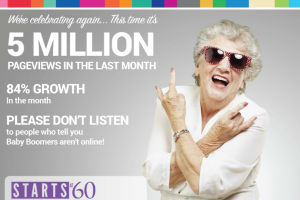 Seven West Media secured a 33% stake in the Starts at 60 website, which targets people over 60 and has 1.5 million unique users and five million page views each month. The investment opens the door for advertisers to one of Australia's fastest growing and wealthy online communities, supporting the website's expansion of content, technology and operations. 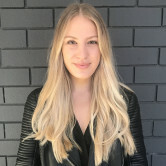 Its founder Rebecca Wilson tells AdNews the partnership provides Starts at 60 with greater commercial clout from a media owner that dominates the older demographic market. It also helps Seven West boost ties with that market. “We've been invisible to ad agencies for so long. We're proud of the space we've created and now with Seven we can offer more to the advertisers – they will be able to buy for a demographic that has been pretty much untouched," Wilson says.